The Queen’s Assassin is a fast paced, turn based card game for 2-4 players that plays in under an hour. My kids and I built the game one night while we were bored and over the last 4 months we have made it into the game it is now. We had been play testing the basic game with different groups and when we realized that people like it we decided to go to the next level and get it published. The last month we have been play testing aggressively with a number of different people and families and after rounds and rounds of testing and mutations to cards, rules and variations we have built a great game. We are very proud of the game and how it plays. We love how people respond enthusiasticaly when they play it. 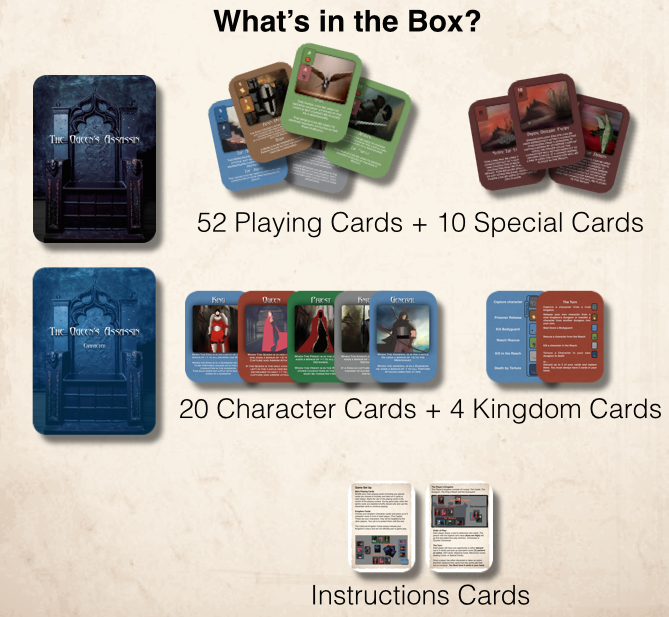 The Queen’s Assassin is highly interactive, the strategies depend on the cards, your hand, your draws, and the intentions of the other players. It is beautifully balanced, with a simple game mechanic that grows in complexity the more you play. When you purchase a copy of The Queen’s Assassin you get a tuck box of 90 high quality poker cards. 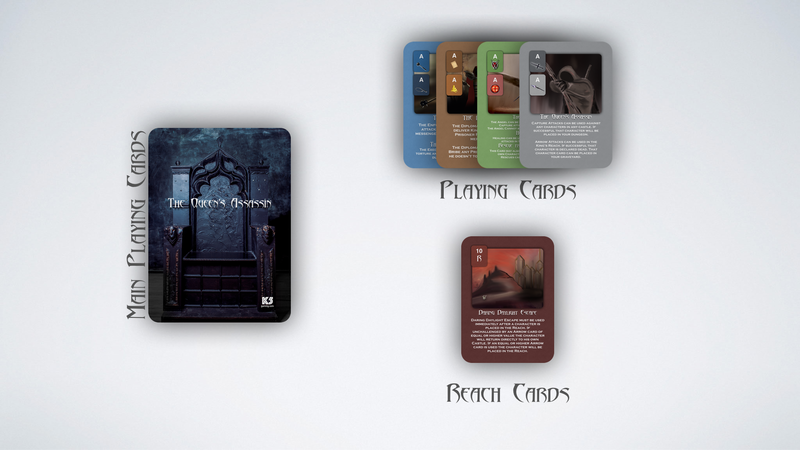 The game cards consist of 4 types of main playing cards and a series of special cards. The blue cards are the mercenary/ Jailer cards. The brown cards are King’s Decree and Bribes cards. The Green cards are Shield/ bodyguard/ Healing and Rescue Cards. The Grey cards are your Capture and Attack Cards. The Red based cards are the Special Cards, they affect all kinds of elements in the game. In this game pack there are 10 special cards. 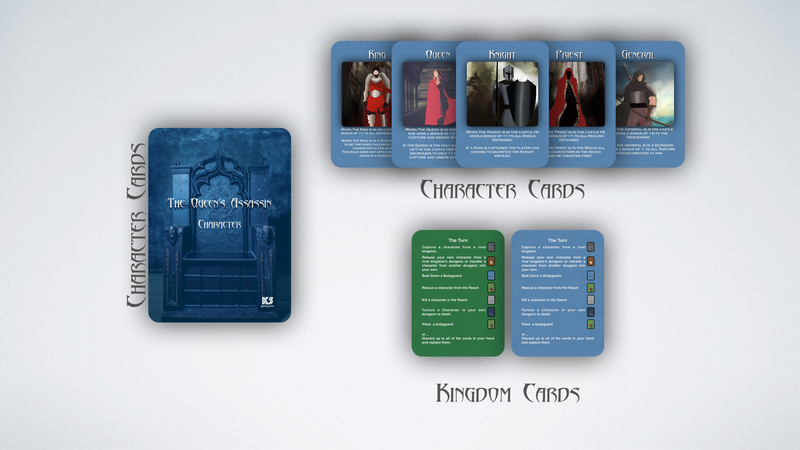 The character cards consist of a King, Queen, Knight, Priest and a General. All of the character cards have special abilities that affect the game in unique ways. Another card in this set is the Kingdom Card, there is one for each colour of Kingdom. In this set there is a Red Kingdom, Blue Kingdom, Green Kingdom and a Grey Kingdom. I have included a set of downloadable instructions for those of you who love to read. For those who would prefer to watch a video check out my gameplay tutorial below. As we have been playtesting this game some interesting variations have been proposed. Some of these we are not ready to adopt as of yet but if you want to try them here they are. – You can use as many cards as you need in attacks or Defences. – Any number of people can join in on attacks or defences.